O, Twit, it is all water, babble, mirth––cobbles and sod Gloria. That is the gist. What prosody. Somewhere cicadas still click their chorale. Maggot choristers drowse. I cry for wing’d things, for grass that summers up peering eyes. This is the time of crows, their audacious speech, specious eyes, beaded fixities. Little there is of fixity. Beneath me the aroused bank, a coverlet, stirs. Mumbled consonants assemble totemic. Calendar’s show of cavalier stunts exceeds its repertoire. Furthering light assails my eyes, featureless islanders floundering, marooned or, fool-like submersibles tenant my face. Something fumbles at the latch. Something waits in its chamber. I think tarp, cantilevered above, explains bluish indifference to ravished wings. Perhaps that is a way to travel, transcending the latitudes, pressed into service in the mouth of that rackety terminus, Earth, furrows in a temblor. Obsequies will be made in the toolshed. For the concerted omission there is much to be said. And for the concertina, so plaintive and tinny. Someone still weeps for Adonais. Dido laments. My lips move yes but I do not speak. That is, I’ve nothing to say unless I hear it emitted. Although I sometimes have the impression I have thought something, I learn I am mistaken. The world wags, I do not wag it. I do not have a glint in my eye. I see but do not understand haze-illumined motes, or beyond footlights, that darkened blur, an ensemble. Neither can I long for an answering presence. I am made to jounce on a perch re-enacting states of glee. I have no tumbrel of tears. Oblige me by ignoring my flawed sense of the apropos. Someone with whom I’m not acquainted calls himself Maestro. When he lifts his hand, my eyes close. I could be thought mistakenly to be asleep, to be in a state of ecstasy, epiphany or ennui. I have a grim capacity to blink and click, to convey selective sensations, but not anxiety, panic. No tenderness suffuses me. I am not made to woo. I’m enlivened by the projections of others, I have none of my own, no skin to shiver, no startling up in me of awe, no sense of the magnitude of this gaping yaw. I’m made to feign and exult. I think my rictus is perceived as a gape of the affable. What an error. This smirk makes me look witless. That eerie laugher purports to represent me. My life? It began as a rough-hewn chunk, a heap of tossed shavings in arabesques of rapture. Now I live with memorabilia, lost playthings of desire. Transient shadows lurch and flag. I became what I am. Whittled chunk. Lunkhead. I have no playmate. I am incapable of a penetrating gaze. I cannot achieve the mockery of one eyebrow arched in disbelief. I have no beliefs. I am not swayed by outcries or guffaws. Chance does not befall me. These fleet suppositions do not create exultation in me. Beneath my carved grimace I have a dim apprehension I am hapless foil to the one who plays false foil. I cannot protest or desist. I hear voices not my own called up by a switch of wardrobe, a jerked string. Hinges of my mouth pop. Put me in a different suit chock-a-block with checks, a bow tie, I’m a toy cavalier. Put me in a black suit and band, I advert to an inconsolable. Now I’m an occupant of the innermost trunk. I am made inanimate against my will. I’m weighed by considerations, garrulous when I wish for silence. I can’t be victor in this joust on a lap. I have vertigo, ear wax. Oil in my joints. I think this symbolic trek is a draught from the wings, the scuffle of phantasms impatient to mouth their lines, then to be absorbed by the mirroring abyss. I am not competent to distinguish between bones and kindling, maggot revels, dust without shuffle or ember in process––future ash my fate. Consider the verticals without leash or valise. Find them in the aisles, in theater seats, in bleachers in stadiums, in the arena, pedestrians, jaywalkers, gawkers, pomposities. I ask if I do not resemble them rather more than not. And what of the legislators? What do they legislate? What is surveillance but what I already do, that they do. Clairvoyants are no use with the mess we are in. We need real seeing eye dogs. Better non-slip decals for our bathtub. Camouflage. Did you think I don’t read because I have no brain? Grave egregious errata. landscapes in which to take up residence, as fly buzz does on a swag. 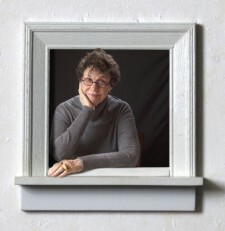 Sandra Stone is the winner of two Oregon Book Awards, winner of the Dana Award, Poetry Society of America artist award. As visual and conceptual artist, she collaborates with architects on literary narrative for public interiors and the landscape. She has completed three libretti for inter-related serio-comic chamber operas that subversively mirror our times. She lives in Portland, Oregon.